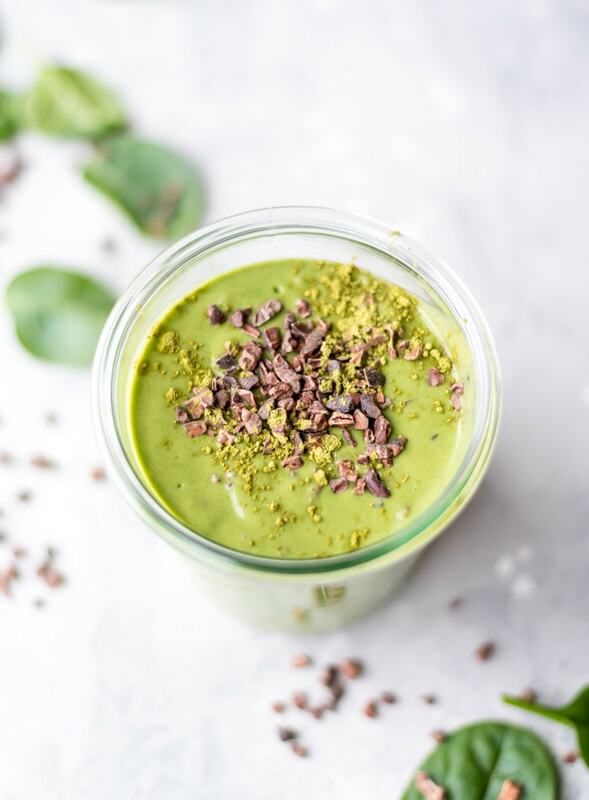 This vegan mint chocolate chip smoothie has some secret healthy ingredients that really takes it to the next level nutrition-wise. 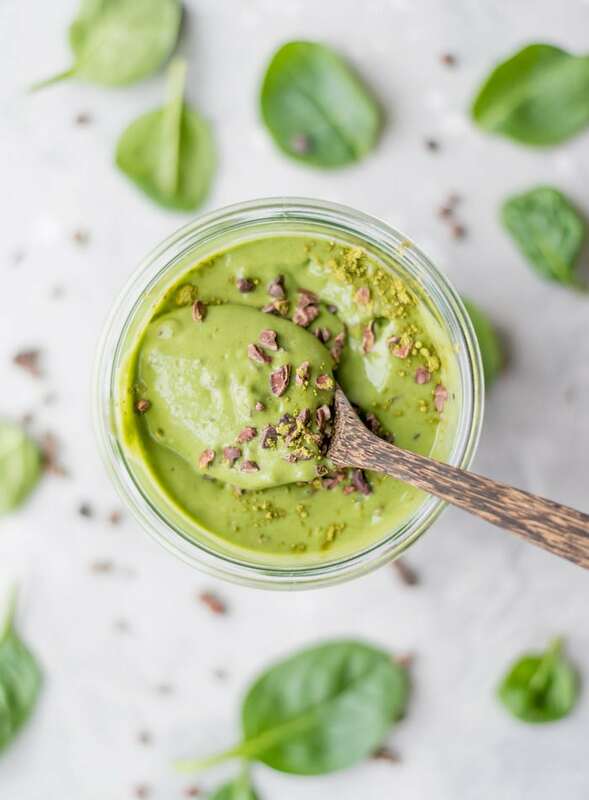 You’ll be adding healthy zucchini, avocado and spinach but they get hidden by sweet, creamy frozen banana and vegan vanilla protein powder, so you’d never guess they’re in there. 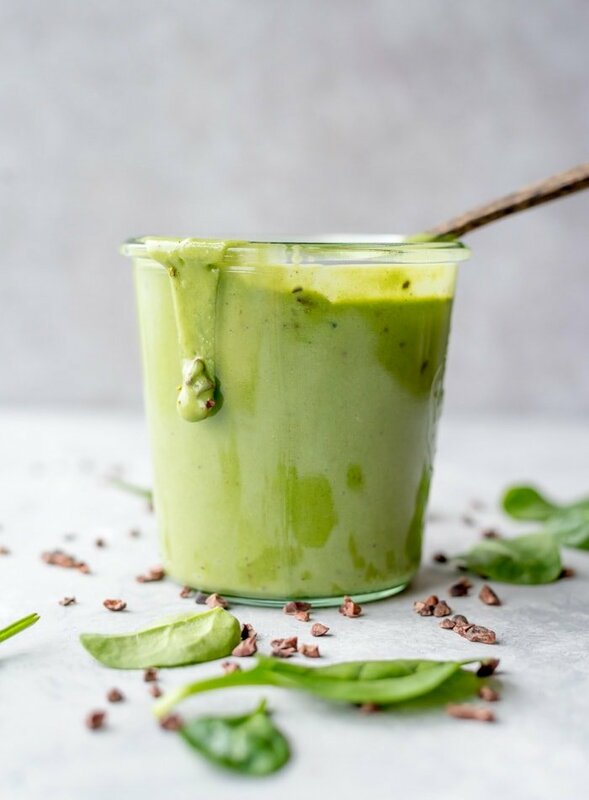 Not only does this beautiful, green smoothie taste incredible but it’s seriously packed with nutrition thanks to these 3 superstar ingredients. I really like sharing recipes that fall right between tastes amazing and loaded with nutrition. This is one of those recipes. I’m obsessed with the mint chocolate chip ice cream-esque flavour and all the good stuff that’s packed in here. 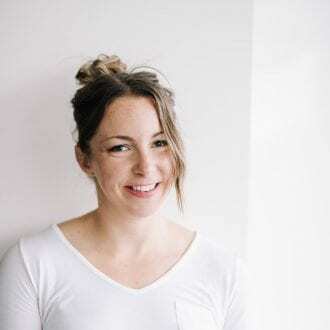 In addition to a ton of micronutrients, for 380 calories you’ll be getting 38 grams of energizing carbohydrates, 17 grams of healthy fats, 30 grams of plant-based protein and 14 g grams of dietary fibre. As for micronutrients, it’s got an amazing 1100 mg of potassium, 40% RDA of vitamin A, 90% RDA of vitamin C, 62% RDA of calcium (if you use store-bought almond milk) and 30% RDA of iron. Let’s see what else we got in here. Bananas are an excellent source of potassium and vitamin B6 and a good source of vitamin C, fibre, riboflavin, magnesium, biotin and carbohydrates. Since they have a lower water content than other fruits, they contain more sugar, which makes this a good choice for a pre or post workout smoothie, especially with all that potassium in there too. Potassium is one of the most important electrolytes in the body as it helps to regulate heart function and blood pressure. High-potassium foods have been well-studied for their effectiveness in lowering blood pressure and reducing the risk of stroke. In addition to all that potassium, bananas contain a soluable fibre called pectic that helps lower cholesterol and improve digestive function. Spinach, along with other dark, leafy greens, is one of the best foods you can eat on a daily basis. Spinach is an excellent source of vitamin K, carotenes, vitamin C and folic acid. IT also contains manganese, magnesium, iron and B12. As for iron, it actually contains twice as much as other greens which is why it may be so good for energy, vitality and improving the quality of blood. Spinach is also one of the best alkaline-forming foods, making it a good choice for regulating the pH of the body. It’s rich in lutein, making it important for eye health and it also contains chlorophyll, carotenes and a range of flavonoids that make it a strong protector against cancer. Note that spinach is among the foods that contain the most pesticide residue, so if you can buy organic spinach, go for it. Avocado. Where do we begin with this one. Besides its beautifully creamy texture and delicious taste, avocado is high in monosaturates, or unsaturated fatty acids that include oleic acid and linoleic acid which help to lower cholesterol. Avocado is also high in potassium, vitamin E, B vitamins and fibre. One avocado actually has two to three times more potassium than banana however we wouldn’t normally eat a whole avocado at once due to it’s high caloric content. 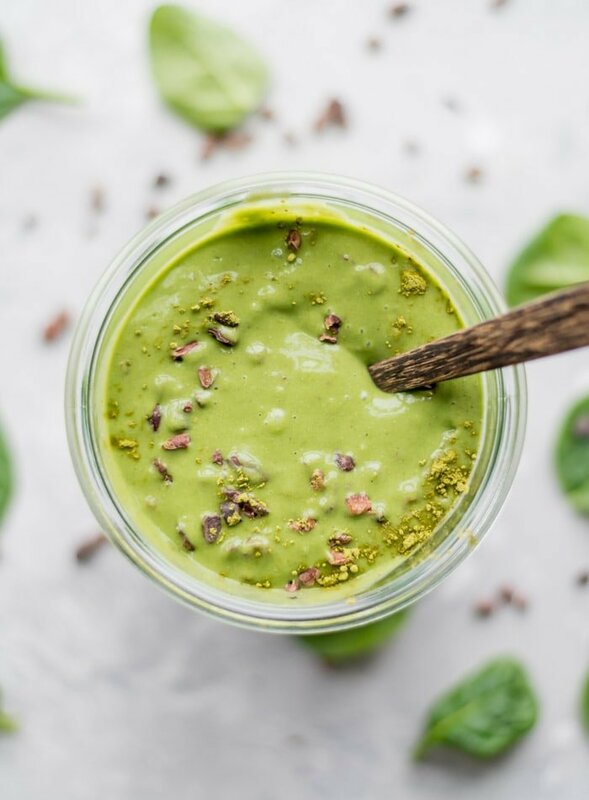 I used 1/4 of an avocado in this smoothie to add healthy fats and some extra creaminess. Zucchini has a high water content that makes it very low in calories and I love it for adding volume to smoothies without adding sugar. It also provides potassium, carotenes and vitamin C.
Cacao is chocolate in it’s purest form. It’s thought to be the highest source of antioxidants of any food and it’s also high in magnesium, an important mineral many people fall short on. Cacao tastes bitter but rich and decadent. I absolutely love cacao nibs and use them as a topping on almost every smoothie bowl I make. Cacao nibs are simply cacao beans chopped up into pieces, similar to a chocolate chip except they don’t have any added fats or sugar. 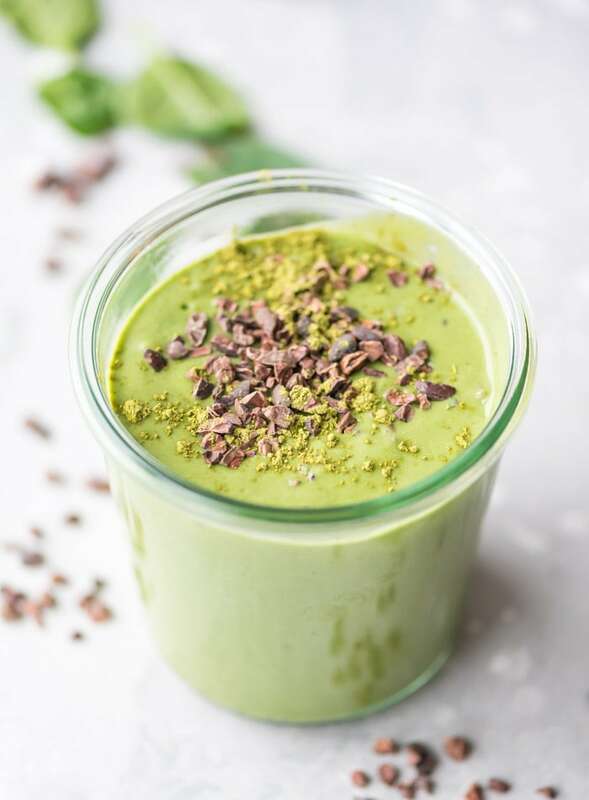 They do however, still contain all the nutrition you’d find in the cacao bean and they’re crunchy texture and deep chocolate flavour make them perfect for this mint chocolate chip smoothie. Cacao in all it’s forms is an excellent source of fats, vitamins, minerals, fibre, natural carbohydrates, and protein that make it an excellent and energizing smoothie superfood! If you love chocolate, cacao is a must-have for your kitchen! You can also try it in my Chocolate Zucchini Smoothie Bowl or my Chocolate Almond Avocado Smoothie. Spirulina one for the most nutritious concentrated foods on the planet and it’s gorgeous, bright and beautiful green colour is amazing for creating smoothies. Spirulina is an algae and contains the highest percentage of protein of any food, not only that, the protein is bioavailable, highly digestible and is a concentrated complete protein because it contains all the essential amino acids. This makes spirulina an excellent food for vegetarians and vegans. Spirulina is anti-inflammatory, high in vitamins, phytonutrients, antioxidants has been shown to reduce the risk o f stroke, enhance eye health and reduce cholesterol. 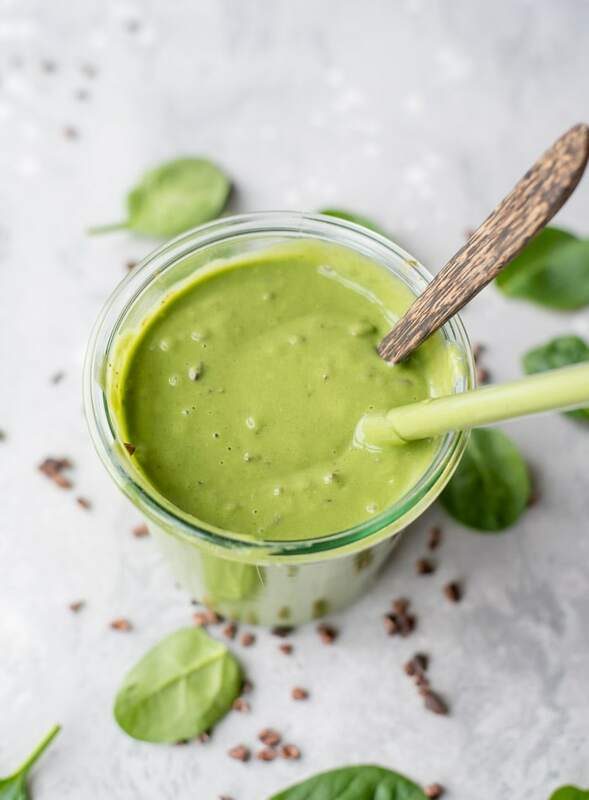 Spirulina has a very strong flavour (it kinda tastes like pond water) so the easiest way to use it is blended into smoothies where it’s flavour can be masked. It can be found in powder, liquid and capsule form. You can also try it in my Green Smoothie Bowl. Okay, we talked about all the reasons why you might want to try this smoothie but we left out one very important reason: MINT CHOCOLATE CHIP. I don’t know what it is about mint and chocolate together but it’s just so good! I’ve made mint chocolate chip smoothies with fresh mint before and to be honest, I don’t love the flavour fresh mint creates. It’s okay for other smoothies when you just want a hint of it but when it’s one of the main ingredients, I needed the perfect fresh, minty flavour. For this I used Simply Organic Peppermint Extract. If you don’t have any peppermint extract, you can use a small handful of fresh mint leaves instead. 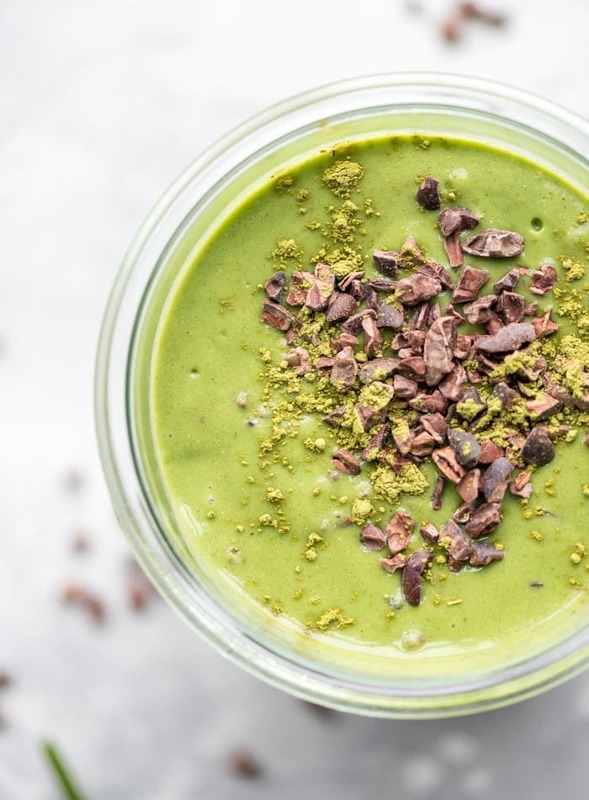 To make this smoothie, just add everything except the cacao nibs to a blender and process until smooth and creamy, try not to over-mix it though or it will start to melt. Once it’s blended, add the cacao nibs and pulse a few times to combine. You can also reduce the amount of liquid used and enjoy it as a thick and creamy smoothie bowl with extra toppings, or you can add a bit more liquid for a drinkable smoothie. I love eating smoothies with a spoon so they feel a bit more substantial, so I usually go the smoothie bowl route. I used 1 cup of almond milk in the recipe, which lands it right between bowl and drink, it’s thick enough to eat with a spoon but you can still it through a straw. Add everything except the cacao nibs to a high-powered blender and mix until very smooth and creamy. Add the cacao nibs and pulse a few times or just sprinkle them on top or stir them in. You leave the zucchini raw? I do, yes. You can steam if i you prefer. Thanks! Me too, so good! Let me know if you try it! THIS was awful. I only put 1 tsp. Of mint extract in and it was way over bearing!!! I’ve made mint chip smoothies before and this one is by far the worst! Sorry it didn’t work out for you Kora. I love this smoothie. What exactly didn’t you like about it, just the overbearing mint flavour? I’ve found mint extracts vary greatly so I’ll add to the notes to start with 1/4 tsp and add more to taste. Thanks for you feedback. Can you add kale instead of spinach? Sure. The kale taste might come through a bit more as spinach has a milder flavour than kale but it will work fine. Enjoy!